A pilgrim journeys to sacred Tibetan land, but falls short of enlightenment. I knew as soon as I arrived here that I couldn’t stay. The central room of my Tibetan guide’s home—where I am lodging for three days—is dark as tar. The smoke billowing from the hearth fire weakens the single lightbulb’s glow. I can just make out an ash-covered kitten huddled next to the coals. A red turban, presumably attached to a body, bobs above the fire. Crossbeams coated in grease hang above me. Five family members, all of them men, huddle in the gloom with me around a small table. They take turns staring at me, chewing on roasted barley seeds and spitting out the hulls. They hand me dirty cups of slippery yellow liquid—yak butter tea. It is like slurping fat. I've traveled all the way from Seattle to witness the holy peak of Mount Kawagebo and to experience Tibetan Buddhism in its motherland. I am 10,000 feet up in a mountain valley in Yunnan Province in southwest China. The foothills of the Himalayas. Even as the sun sears the glaciered mountains outside, inside my pupils flare wide yet take in only darkness. I’ve traveled all the way from Seattle to witness the holy peak of Mount Kawagebo and to experience Tibetan Buddhism in its motherland. But along with my vision, these aspirations have vanished. One of the men, his black hair fusing into the darkness, leans in to examine my face, as though he is inspecting a circus freak. The whites of his eyes roll wide. He speaks. I shake my head. “I don’t understand,” I say in Mandarin. I know they don’t speak Mandarin, especially my American-born version, but I don’t know what else to say. The man chuckles. He lights a cigarette with hands worn and gnarled. I don’t know how much longer I can stand sitting here. My eyes and lungs are stinging from the smoke and I have to repress the urge to cough for fear of offending my hosts. Suddenly we hear a scuffle in the doorway. A rooster races in. He snaps his beak and bites my knee. “Ow!” I yell. I leap up. Propelled by embarrassment and frustration, I stumble toward the door, my arms outstretched like a mummy’s in a horror movie. I jerk and prod, kick my feet forward, and then trip on the horizontal beam that lies across the bottom of the doorway. As I scramble to my room, I hear the men laughing behind me. I seek refuge in my bedroom, a sunless space with a window overlooking the pigsty. Smoke saturates every membrane of my body. I am dying for a shower. I fantasize about a down blanket, dark chocolate, and a reading lamp. I want to clean my contact lenses in the wash basin outside without fishing out specks of dirt. I want to understand Tibetan, or better yet, for everyone else to understand English. Buddhism just didn't seem to fit in with my American lifestyle. I was too busy and too occupied with modern distractions. Back home in Seattle I had dreamt of the Himalayas, their sacred peaks and forests choked with Buddhist shrines and Tibetan prayer flags. The land where the 22,000-foot peak of Mount Kawagebo scraped the sky and yak bells echoed. And so here I am. Even as I perch in a mountain valley whose beauty evokes Shangri-la, I can hardly bear the physical hardships of life in a Tibetan village. To get here, I had hiked with my guide for over five hours at high altitude. When we reached the 12,000-foot pass, I collapsed in a teahouse. Hiking wasn’t exactly a recreational activity around these parts. Now that I’ve arrived, I discover that I am not spiritual material. I can’t sit still. I can’t sleep. I can’t stop fantasizing about the day I will hike the mountain pass back out. Enlightenment seems like a big joke. As I perch in a mountain valley whose beauty evokes Shangri-la, I can hardly bear the physical hardships of life in a Tibetan village. Guilt plagues me. Wasn’t my sitting practice supposed to transform here? Instead, I’ve abandoned it. I’ve become a Buddhist dropout. As I wander into lime-green pastures after a rain, sunlight falls in wet streams to the earth. I climb on a rock and sit down. The beauty and the serenity of this land brought me here. So why am I so unhappy? I am cranky and wallowing in buyer’s remorse. I feel like I’ve discovered that sea monkeys are really just brine shrimp. When I see grannies hauling barley lashed to their bony backs, their smiles fill me with shame. The next morning, five Buddhist monks arrive at the house. They flow in a parade from grown men down to boys. I can spot their maroon robes and saffron-yellow scarves all the way across the valley. The giant house swallows the monks up and they disappear without a sound. I’m hiding out, as usual, in my bedroom. My guide, Zhuo Ma, raps on my door. Nineteen years old, she still bears baby fat in her cheeks. “Come meet the monks.” She cajoles me like a mother coaching her toddler to eat strained peas. When I finally rise to join her, Zhuo Ma leads me through a doorway framed by red strips of gold-embossed Tibetan characters. When I step into the space, I gasp. It is the family’s shrine room. Thangkas—scroll paintings of sacred and mythological beings—cover the walls, as do posters of the Potala Palace in Lhasa and photos of lamas. The scene is magical. The five monks are seated cross-legged around a low bench. The table holds a round-bellied teapot, cookies, and tiny tangerines wrapped in plastic. The monks sip yak butter tea and reach with slim fingers for what appear to be sugared popcorn balls. I sit down on a cushion next to the younger monks. They regard me carefully, the way you might study a scared, twitching animal. Their dark doe eyes and shaved heads remind me of American junior high kids, only instead of soccer silks, they are wearing monks’ robes. I’ve never sat among Buddhist monks, much less in a Tibetan home. For a moment, I feel joined to the seekers before me, and I convince myself that perhaps I can indeed succeed at this meditation business. I expect these monks to be wise, patient, and otherworldly. I can learn from them. I expect these monks to be wise, patient, and otherworldly. But then sounds from a construction site next door—men dropping lumber, shovels scraping gravel—grab the boys’ attention. They crawl to the window, peer out, and giggle. The eldest monk calls them back sternly. The younger monks sit back down and squirm like a litter of puppies. They rearrange their robes and fold the maroon fabric this way and that. I smile. Before they are monks, they are boys. The eldest monk smiles at me. He makes me feel jumpy. I can’t tell if it is from fear that he will pose a Deeply Profound Question that I can’t answer, or if it’s from the fact that I find him vaguely attractive. His smile arrests me. It is not like the masks we wear in the West to hide how we feel. Instead, I see sadness in his eyes. I know this monk has endured snowstorms at high mountain passes, witnessed infants dying at birth, and felt the sharp bite of hunger. Yet his smile is as fresh as morning sunlight. “My parents were born in China,” I explain. Surely they’d heard this story before. But the monks stare at me, their faces riveted to mine. “But they moved to America. I was born there,” I finish. I might as well have said that I was born on Venus. “But she looks Chinese,” they say again. They discuss this perplexing matter. I look at Zhuo Ma. She shrugs. Reincarnation, choosing times of death, visualizing unseen beings—these are stand in the Tibetan Buddhist playbook. “My parents are Chinese,” I say. By now I am bursting with laughter. Had these men and boys been ordinary villagers, I might have understood their confusion. But they were monks. Not just any monks but Tibetan Buddhists, a branch known for intensely rich and intricate cosmology. Their spiritual practices are known for transcending the physical world to planes few of us even know exist, much less visit. Reincarnation, choosing times of death, visualizing unseen beings—these are standard in the Tibetan Buddhist playbook. Yet these monks cannot comprehend the mundane fact that this Chinese woman before them is American. When the eldest monk regards me again, I smile back at him. Never have I felt as lost as I do here in Yunnan. Yet the monks’ baffled questions about my cultural identity suddenly ease my own frustration with my spiritual identity. I realize that I’ve been grasping and striving toward an image of myself as an awakened being, while missing out on just being. Perhaps the question is not whether I’ve flunked or passed Buddhism but whether I’m living it. 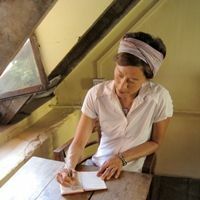 Eve M. Tai is a Seattle yoga teacher, a freelance writer, and a mother to Olive, a three-legged pit bull.